"...a book with the emotional heft of a true memorial instead of merely a pop-culture cash-in..."
"This is a meticulously researched and thoroughly in-depth book. The level of detail is grand in scope, while being entertaining at the same time..."
"... a real treat for all fans of the classic film..."
Andre Delambre is a devoted husband, a loving father and a brilliant scientist. When his body is found in his laboratory with his arm and head crushed by a hydraulic press, his wife Helene admits to having killed him. Believing Helene incapable of such a crime, Andre's brother slowly uncovers the truth - that an experiment with Andre's new teleportation device went horribly wrong and Andre persuaded Helene to assist him in suicide. When the American Film Institute distributed a ballot with 400 nominated movie quotes to a jury of over 1500 film industry figures, the above quote came in 123rd. But this film's influence extends far beyond a simple quote. The movie's concept, ending and the quote have permeated pop culture from 1958 to The Simpsons to a 2008 opera based on a 1986 film remake by David Cronenberg. 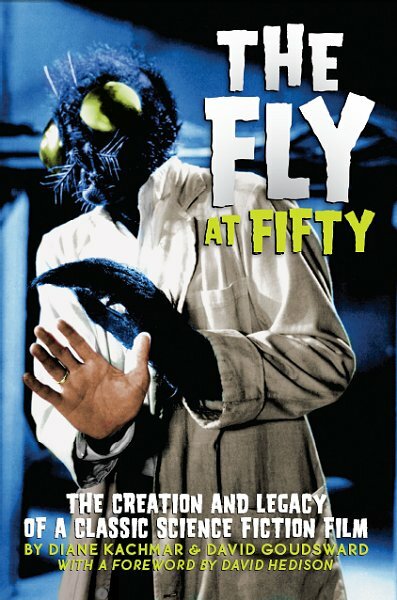 The original movie The Fly was the surprise hit on 1958. Shot in 18 days at a cost of $450,00 dollars, it brought in $6 million, which at time when Fox Studios was in desperate need of a hit. It was the biggest box office film of director Kurt Neumann but he would never know - he died one month after the premiere (a week before the movie was released nationally). This film made a star of David Hedison and cemented Vincent Price's place among the horror film immortals. It is more than a tale of science gone wrong and hideous mutants. It is a film classic, the rare perfect blending of story, cast and crew, with the fantastic elements in sync with the universality of Andre's struggle with what he had hoped to do with this technology and what actually happened to him. That struggle touches everyone who has ever watched this film and why, after 50 years, it remains a classic. Complete with reminiscences from the film's stars, David Hedison and Charles Herbert, this book covers the history and legacy of this seminal film. Named One of the Best Books of 2008 by Famous Monsters! Chapter Two - Albert David Hedison, Jr.
David Hedison starred in The Fly as doomed scientist Andre Delambre, his first starring role in a film and he?s never looked back. Best known as Captain Lee Crane on Voyage to the Bottom of the Sea and for appearing as Felix Leiter in two James Bond films, Live and Let Die and Licence to Kill, David remains active by working at the Actor?s Studio, appearing in regional theater and making an occasional personal appearance. Charles Herbert was a familiar face to movie goers and television viewers throughout the 1950s and 1960s, appearing in twenty films in six years, along with countless television guest appearances. Today, he is actively involved in A Minor Consideration, a non-profit foundation that offers guidance and support to young performers: past, present and future. Diane C. Kachmar is a University Librarian at Florida Atlantic University. She maintains www.davidhedison.com and is the author of Roy Scheider: A Film Biography (2002). You can also visit her on the web at Author's Den. David Goudsward is the author of a variety of books, ranging from archaeology in Ancient Stone Sites of New England (2006) to horror movie settings in Shadows over New England (2008). His next books on H.P. Lovecraft?s visits to the Merrimack Valley of Massachusetts is due out in 2009.